Are Parabens Bad For Your Skin? Lately, parabens – a common ingredient found in cosmetics – have been getting a good deal of negative attention. What are parabens, and should you avoid them? If you have noticed the “paraben-free” labels on many of the cosmetic products lining drugstore shelves, you may be wondering what parabens are and why it matters whether a product contains them or not. Parabens are widely-used preservatives that stop the growth of bacteria, fungus, and other microbes in makeup, moisturizers, and other personal care products, especially in a warm, moist bathroom environment where these products are often kept. 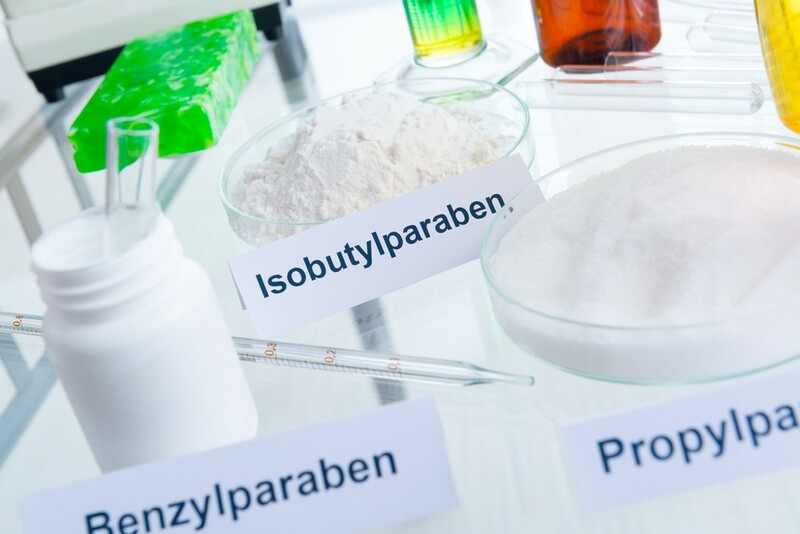 Some common forms of parabens include methylparaben, propylparaben, ethylparaben, butylparaben, and isobutylparaben. Many personal care products including shampoo, makeup, and lotion contain these ingredients. However, in recent years, they have come under scrutiny by scientists, cosmetic manufacturers, and product safety regulators regarding their safety. Some of the claims against parabens are serious. They have been found in breast cancer tumors, making experts wonder about a possible link between parabens and the recent increase in breast cancer. Declining sperm counts, male breast cancer, and testicular cancer are also on the rise, leading to questions about whether parabens could be to blame when absorbed by the skin. Parabens are also known to imitate estrogen in the body, and estrogen exposure could cause the development of breast cancer, so there is concern that repeated, long-term exposure to parabens could be a possible health risk. Research into this concern is ongoing, but for now, the claims are unsubstantiated. There is no decisive evidence linking parabens to cancer, but this is an area of concern that researchers continue to investigate. In the meantime, there is a more concrete reason to avoid parabens: they can irritate your skin. They are known to cause skin problems such as rashes, eczema, and allergic reactions in sensitive individuals. Considering how easy it is to find paraben-free products, it’s probably best to avoid products that contain them since they can cause skin irritation and could create more serious health problems. Furthermore, they make their way into the ecosystem and may be harmful to marine life. Formulating products without the preservative benefits of parabens is challenging. However, there are many safe alternatives available instead. Parabens are often used because they are cheap and effective – but manufacturers are always looking for better, safer options. Some experts expect parabens to be phased out because of consumer demand over the next ten years or so, with products containing more natural alternatives are becoming more commonplace. In the meantime, consumers can choose from a growing range of natural and effective products such as the Auolive skincare line. Auolive’s simplified skincare system does not contain any parabens and other harmful ingredients such as colouring , synthetic dyes, sulphates and mineral oils – but just natural active ingredients which give you the healthy, glowing that skin you want. Try Auolive today and see the difference for yourself!